CLEVELAND — Trevor Bauer predicted he’d win the 2019 Cy Young in that Sports Illustrated article from February, the one that received more attention for his rules about dating. His take was hardly surprising. The baseball stuff or the relationship GPS he shared. Bauer’s work — if not his win total — (I’m referring to baseball here) deserved Cy Young consideration a year ago before a Jose Abreu line drive in mid August put him on the disabled list with a stress fracture. MLB.com summarized his 2018 season at the time of the injury: Ranked first in home run rate, third in strikeouts, fifth in ERA and top 10 in strikeout-minus-walk rate at the time but didn't have a big win total. 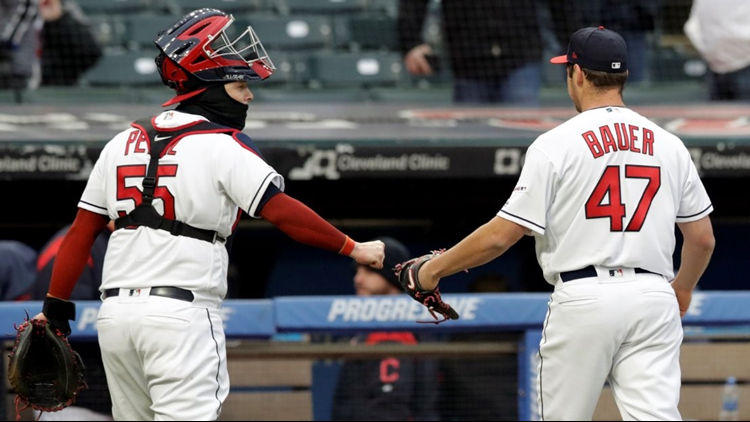 In holding the Toronto Blue Jays hitless for seven innings Thursday, Bauer became the first pitcher since 1934 to begin a season by pitching more than five innings and allowing just one hit. Only his strikeout-minus-walk rate wasn’t the usual quality Thursday and for pretty good reason. Gripping the baseball isn’t easy in 30-degree weather, even if you bring Stephen Hawking's understanding to the physics of it. The climate and Bauer’s pitch total (117) conspired to end his night. I don't think a bottom of the seventh that lasted longer than Star Wars: The Last Jedi was a major factor in manager Terry Francona's call. Bauer called being lifted the “right decision” and it was. “I don't really care about a no-hitter or not," Bauer told the media after his second terrific start of the season. "I care about putting up zeroes for the team and winning. And winning the Cy Young. That goes without saying, or writing. But we did it anyway. Bauer still vows to sign only one-year deals, betting on himself to be durable and take advantage of market forces. So extending his dating rules to his baseball career, you could say he’s less than emotionally available for a long term relationship and definitely plans on becoming bed fellows with other teams. Players in the Alliance of American Football had to pay for their own flights home, according to a report, after the AAF ceased operations earlier this week. That’s not all that surprising. Actually, it’s about what you’d expect from the 737 Max of sports leagues. Some players in Memphis came back to their hotels following the announcement to find their belongings already packed and waiting in the lobby. So in a matter of hours the AAF was able to shift focus from having no viable business plan to having no reasonable exit plan. Well done. Seems a little self-involved in the moment. But in the bigger picture, it’s also really self-involved. Patriots owner Bob Kraft’s strategy in defending himself against solicitation charges seems to be that law enforcement’s secret video surveillance of that day spa in Florida was unnecessary in the pursuit of a misdemeanor. Via Pro Football Talk, Kraft’s lawyers argue that the means don’t match the relatively insignificant criminal charges. Winning in court probably won’t help Kraft avoid league discipline. The only winner there would be fans of irony who appreciate a Patriots owner claiming to be the victim of secret surveillance. PFT makes the case for the NFL to pay refs more money. For a job done I guess. In Indianapolis, Colts owner Jim Irsay clearly outlined organizational goals. Which would be slightly better than the Irsay family's current pace of one every 35 years. In Irsay’s defense, he made those statements before Odell Beckham Jr. showed up in Berea for a press conference with Baker Mayfield, Myles Garrett and Jarvis Landry and Beckham claimed April 1 might well go down as an “iconic” date in Browns history. And here we thought the road to the Super Bowl in the AFC goes through New England until Bill Belichick hangs up -- or, more likely, throws out -- his hoodie. A more iconic press conference would be one where the four players are talking about a season-opening win. Assuming those can really happen in Cleveland. Just in case work and family obligations have commanded your full attention and you hadn’t heard, there is a high school-aged baseball prospect in Maine named Princehoward Barbecue Yee. He gives. He gives and gives. And what does he get in return besides an average of $16.7 million a year? A Bleacher Report story says former Packers coach Mike McCarthy was unavailable for some meetings because he was getting a massage in his office. Well done, grasshopper. Said Mike Holmgren. McCarthy denied the report by former Packers beat reporter Tyler Dunne, saying he never missed team meetings for massages but did get massages to treat issues in his back. Perhaps stemming from the stab wounds. Final Four picks: Auburn over Viriginia; Texas Tech over Michigan State. So there you have it. Bet the opposite, accordingly.